Ensi-illassa nähdään neljän lyhytelokuvan sarja, joka kertoo säveltäjä Johannes Brahmsista ja hänen suhteestaan romanttiseen runouteen. Brahmsin musiikissa kiertyvät yhteen romantiikan keskeiset teemat: luonnon kauneus, haaveellinen rakkaus, romantisoidun keskiajan ihailu ja satujen maailma. Lyhytelokuvissa välitetään monipuolisesti Brahmsia koskevaa tieteellistä informaatiota. Niissä esitetään Brahmsin laulu-, piano- ja kamarimusiikkia sekä soitettuja musiikkiesimerkkejä ja käytetään lisäksi kuvan, multimedian ja videotaiteen keinoja. Dokumenttisarjan on ohjannut videotaiteilija Paula Saraste ja käsikirjoittanut Brahms-tutkija ja pianisti Terhi Dostal. Elokuvissa esiintyy lisäksi joukko suomalaisia eturivin muusikoita: viulisti Pauliina Valtasaari sekä laulajat Annami Hylkilä, Ann-Marie Heino, Niall Chorell ja Aarne Pelkonen. Elokuvien tuotantoa on tukenut Sibelius-Akatemian kehittämiskeskus. Kielet: englanti ja saksa, tekstitys suomeksi ja englanniksi. 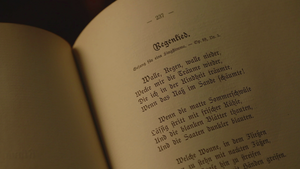 These four short films tell about the German composer Johannes Brahms and his relation to the Romantic poetry. Many important themes of the Romanticism intertwine in Brahms’s music: beauty of nature, fanciful Romantic love, admiration of the romanticized Middle Ages and the world of fairytales. The films impart the scientific information on Brahms with multifaceted means: performances of Brahms’s songs, piano and chamber music, played music examples, illustration, multimedia and video art. The series of documentary films is directed by the video artist Paula Saraste. The script is by the Brahms scholar and pianist Terhi Dostal. Several well-known Finnish musicians perform in these films: the violinist Pauliina Valtasaari and the singers Annami Hylkilä, Ann-Marie Heino, Niall Chorell and Aarne Pelkonen. The production of the films was supported by the Development Centre of the Sibelius-Academy. These four documentary films tell about several themes of my Doctoral Thesis in an easily digestible way. They were filmed 2013 in Helsinki (Music Centre Studio), Berlin (Ballhaus Rixdorf Studios) and in several places in Brandenburg (Cloister Zinna, Schloss Wiepersdorf). The project was funded by the Sibelius-Academy Development Centre. You can watch all these films online in the Siba-TV by clicking the links. Photos from the project are to be seen here. For the Romanticists, very interested in the Middle Ages and also in the Roman Catholic Church, cloisters were an especially popular setting for their tales. 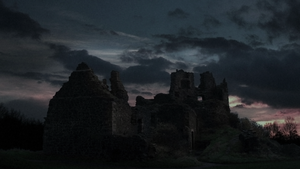 Catholicism fascinated the Romanticists with its dark history, mystic experiences, its miracles and saints. As a true son of German Romanticism, the German composer Johannes Brahms composed several cloister songs. In many of these Brahms songs, the convent is described as a lonely and dismal place. The nuns in Brahms' compositions are invariably sad and often even unhappily in love. The Romanticists loved fairy tales and their fantasy characters. The Grimm brothers were among the best-known storytellers of European folk tales. As a true son of the Romantic ideals, the German composer Johannes Brahms grew up with these fairy tales. Even as a mature man, he had many similar books in his library. 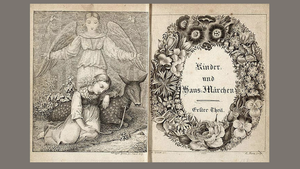 The 1816 edition of Grimm's fairy tales remained in Brahms' library almost all his life. Brahms adored ballads, songs which tell a dramatic story. Many Brahms' songs contain fairytale-like characters or supernatural elements. Most pianists and violinists know Brahms's song Regenlied Op. 59/3 because he quotes it in the final movement of his G major violin sonata. He used the same melody also in his song Nachklang. The Regenlied describes rain which brings to mind a flood of childhood memories. Childhood is an unusual song theme for Brahms who preferred to compose songs of unhappy love or of longing. In this Rain Song, the refreshing purity of the rain is compared with the innocence of a child. Brahms returned to this Rain Song five years later in 1879, in his first published violin sonata, Op. 78 in G major. The work may have been some kind of memorial to his godson Felix Schumann who had played violin as a hobby. Felix, the son of Brahms' dearest friend Clara Schumann, died of tuberculosis in February 1879, at the early age of 24. One of Johannes Brahms's favourite ballads was a Scottish folk poem called "Edward". Brahms wrote two separate compositions based on this piece; a solo piano piece, and a duet for two singers and piano. It was unusual for Brahms to use the same text for two different compositions. He was obviously very fascinated by this dramatic poem. 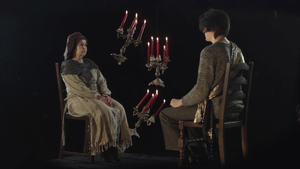 The poem is a dialogue between a mother and her son. Edward has killed his father and returns home with bloodstained sword. Her mother questions him. In the end, the dark secret of this patricide is revealed. Brahms: Ballade Op. 10/1 "Edward"
Brahms: Duet Op. 75/1 "Edward"